Amazingly, there was a bigger turnout for the runoff than in the general election, so congratulations on your passion, 46th Ward! In February, only 10,242 votes were cast in the aldermanic race. Still no results from the 12th precinct, so there's been some equipment failure, we're guessing. That's the precinct north of Montrose, immediately east of Clark. We'll keep an eye on that and the mailed-in ballots and post the official results in a few days. It won't change the outcome of the overall race. Cappleman did best in his home precinct, the 4th, with 66.86% of the votes cast there. Crawford did best in the 22nd precinct, where JPUSA's Friendly Towers is located, winning a whopping 78.6% of the votes there. All in all, Cappleman won 27 of the 39 precincts reporting, and Crawford won 12. 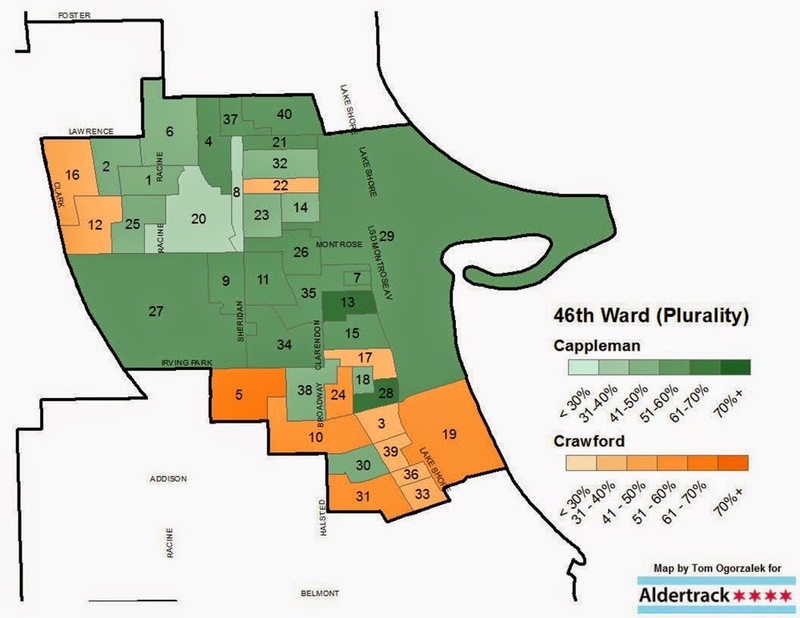 You can see the precinct-by-precinct breakdown here, and a ward map with the Cappleman/Crawford majorities from February here, courtesy of Aldertrack.